Posted by Jace Stolfo on Monday, April 25th, 2011 at 4:10pm. 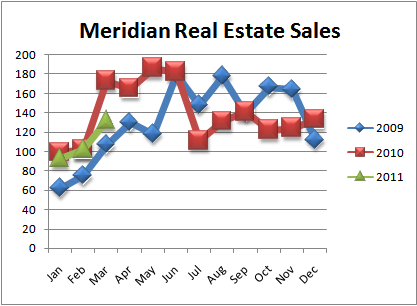 Real Estate sales in Meridian ID have been relatively strong so far in 2011. Although, when comparing last month to a-year-ago you'll immediately notice sales were down about 24%. However, it's important to remember the tax-credit was in full swing and was expected to end 4/30/10 (but then extended to 6/30/10). As a result, sales were booming at this time last year before drastically dropping off mid-summer (see red line on chart below). When comparing March sales to '08 & '09, real estate sales were up 15% & 19% respectively. It's probably safe to assume that the next few months of sales will continue to fall short of last year. 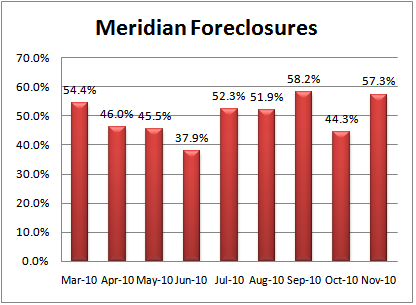 Below you can see the Meridian real estate sales over the last 2.5 years. Although the overall number of foreclosures on the market have been declining, the market share of foreclosure purchases have been increasing. In March 65.9% of the sales were either Meridian Idaho Short Sales or Meridian ID Bank-Owned Real Estate. This is up from 54.3% during the same time last year. Below you can see the market share of foreclosures over the last 13 months.